In the second edition of the #letsgetfoodiechallenge, Amanda challenged us to create a recipe with something green in it. Now I love my greens, so once again, I was a bit paralized by the choices. But since we were heading to Brighton during the last Bank Holiday weekend, and the idea of a picnic on the beach was simply too difficult to resist, I ended up revisiting one of my favourites recipes: Tortilla. Since I got some beautiful spinach at the farmers’ market that same morning, I thought I would add some in as well and cross my fingers really hard for it to work and result in something delicious. And IT REALLY DID! You’ll need: 5-6 medium waxy potatoes, 5-6 eggs (I only had 3, but more would have been better! ), chopped parsley, chopped garlic (I used dried garlic), 2-3 sliced spring onions, 2 big handfuls of spinach, olive oil, salt, pepper. Start by preping all your vegetables. Slice your potatoes up as thin as possible (without slicing your fingers though!). Slice your onions too, and wash your spinach and dry it up. Chop your parsley and garlic. In a bowl, whisk your eggs with some salt and pepper, then add in your garlic and parsley. Get a pan (one that goes into the oven would be perfect here! I got mine from IKEA) nice and hot, then add in some olive oil and your potatoes and fry those until they’re tender. Transfer to a bowl and keep them to the side for now. Fry your onions and do the same. Next up, you’ll need to cook your spinach. Once it’s ready, add the onions and potatoes on top and give the whole thing a good stir to combine all the elements. Pour your egg mix on top and cook for about 5 minutes. Transfer to a hot oven (180-200 °C) and cook for a further 5-7 minutes. Take your masterpiece out of the oven and eat it while it’s hot. Or get some friends together and bring it to a picnic on the beach! What’s your favourite picnic recipe? The previous episode of my “Objective Capsule Wardrobe” series was all about de-cluttering, only keeping the clothes you liked and liked you back and making room in your cupboard and your life! But of course, everyone knows nature abhors a vacuum, and there’s very little point pretending you’ll never want to buy anything anymore now that you have all of that empty space! So I thought it would only be fitting to focus the second episode on strategies to buy better so you don’t have to go back to square one too often. My mum has always tried really hard to explain the whole price VS quality thing to us. I was that kid that never got one pair of expensive branded trainers but was always wearing expensive, well-made leather shoes. But when I first started buying my own clothes, I obviously forgot it all at once for quite a while and ended up with far too many things, many of which that didn’t fit me and I incidentally never wore. I’m not even sure why I fell in the fast-fashion trap. I clearly didn’t need that many things, but it was so cheap and I felt like buying things “in case I’d need it” made me ready to face every situation I’d ever encounter. I was basically trying to build an armour out of all those junk-clothes I’d never wear and believed that my life would definitely be ruined if I didn’t have those sparkly silver heels the day I needed them. Thanksfully, that’s when bloggers started taking a step back and talking about minimal wardrobes. Reading Dead Fleurette and French blogger Une Chic Fille, I had a bit of a lightbulb moment and eventually realised that I didn’t need all these things in my life. That having them around actually made me feel worse rather than good and that my money would be better used differently. That same evening, I sat on the floor of my room and filled two (TWO!) Ikea bags with all the things I shouldn’t have bought in the first place. I donated most of them, sold a few, and promised myself it wouldn’t never get quite that bad again. I obviously needed to come up with a plan though! That’s when I created my very own “Investment Theory” as some sort of a test for potential wardrobe suitors, so I thought I’d share my top tips to buy well! 1. It’s not all about the price! Mark my words: no deal is good enough not to be missed. If you’re never going to wear it, no matter how cheap it is, you are still wasting money buying it. This is especially true when it comes to sales; I’ve bought SO MANY things on sales because it was cheap and I would never find such a good deal ever again! Whether or not I would be using it was a thought that never crossed my mind. So now, every time I catch myself thinking “oh, that’s such a good deal”, I ask myself if I’d still get it if I was shopping in Liberty and it had the usual £££ pricetag. Works like a charm! 2- Well-build items can be fixed. 3- Good-quality material will keep its form and colour much better. 4- You won’t tire of wearing basics quite as quickly as you would of wearing the last fashion fad. 3. Cost-per-wear: If I invest time in money into buying something, I want to make sure I get the best return on it. Which is why I usually only invest in items I know I’ll be using on a daily basis. So before you go out and spend all your money on really beautiful but also expensive pieces, take the time to figure out what you are actually wearing every day. One good way to measure this up is by putting all your clothes in the Closet app which allows you to log in what you’ve worn and does all the hard work for you! 4. Beauty samples: I love how you can get samples for pretty much every beauty product there is. That’s such a great way to try things out and decide whether or not they’re truly made for you without cluttering your cupboards! Do you have tricks to avoid shopping mistakes? I’d love to hear them! I used to be that kid that kept absolutely everything (from magazines’ pages to every inch of ribbon or fabric). My imagination had no limits when I was younger, and I always found ways to use all the stuff I was putting away in boxes under my bed, in my cupboard, and in my siblings’ rooms. Until said siblings didn’t let me use their space as storage anymore and I had to learn the hard way how not de-clutter. But all of this doesn’t prevent me from facing this “OMG-I-have-nothing-to-weaaaaaar” moments every now and then (especially in Spring, what’s up with that? Is it just me or do you get this too?). Weirdly enough, what really helps when that sort of thing hits me is to get rid of things instead of before buying new ones. As they say, less is more. And don’t get me started on the mental space a clutter-free wardrobe brings you! However, de-cluttering is hard work (and sometimes a little soul-crashing too because it might mean you have to say goodbye to that little silk dress you love but doesn’t fit you quite right…). But here are a few things that help me let go of things I no longer wear. 2. Have a few plastic bags/cardboard boxes at hand to put things to sell/donate/throw away. Doing it as you go will make it a lot less tiring as you won’t have to spend extra time in the end tidying things up. Does it fit? If it doesn’t, get rid of it. I know it’s hard, but from my own experience, I can tell you you will never wear it. Yes, even when you loose that extra 10 pounds. Because 1. you don’t know how your body will be shaped then 2. You’ll want nothing more than go buy new things then. And you should do exactly this, because you deserve it! Do I feel comfortable wearing it? There is absolutely no reason why you should wear something you don’t feel good wearing. It really is as simple as that. So if it doesn’t make you feel good, don’t keep it. You can always find something similar, except more flattering / softer / not so tired / you can walk / breathe in (…) and it will worth making that change because you will wear those pieces more (#NoMoreItchySweaters + #TeamBallerinas). If I was shopping right now (and I had to pay full price for it), would I buy this? This little gem really helped me get rid of things that were not exactly top-knotch in terms of quality. Just picture yourself browsing through Liberty’s fashion sections. Now, what if this dress/top/jeans you’re holding were on the rack in front of you. With the usual £££ price tag. Would you still buy it? Would I wear it if I was going out to meet friends right now (or if it was the right season to wear this specific item)? I tend to get a little bit obsessed with lounge wear (as in, stuff I wouldn’t really wear in public but rather to lounge at home… But one can only have that many burger-printed leggings and Bambi Tshirts! ), so that helps me keep this issue in sight so they don’t take too much wardrobe space!! Do I feel like I have to keep it? Is it something that’s been given to you? Or something that cost you a fair bit of money and you feel like getting rid of it would be a waste? I’ve had issues with those items in the past but I just found THE BEST way to deal with this a few days ago! Just ask yourself ‘Would I keep this if it had been given to me by somebody I don’t really like?’ and tadaaaaah, it all becomes a lot easier! 5. Once you’ve gathered the things you’re ready to let go of, you might want to organise them in categories and put them in the right bag/box. I tend to only throw away things that can not be worn anymore (because they’re too damaged/stained…). You’ll want to do this right away (and probably bring the bag down to your bin room so you’re not tempted to rescue things from it.). The rest, I usually divide in things to give away to charities (I do that the next day or so, for the same reasons) and things I’ll try to sell on eBay. Do you find it easy or hard to let go of things, even if you don’t need/use them? Any de-clutter tips for me? 1- Prep your (quick pickled) carrots: In a box with a lid, mix the carrot ribbons and a teaspoon of salt. Close the box and shake it off. After a few minutes, rinse off the salt. Add the rice vinegar and the brown sugar. Close the box and shake it until the sugar has dissolved. Leave it to the side until you’re ready to serve. Onto the rest of the prep: Dice your garlic, cut up your chilli and slice off your herbs, your cucumber and radishes. As it happens, rolling the mint makes it much easier to chop, in case you were wondering! 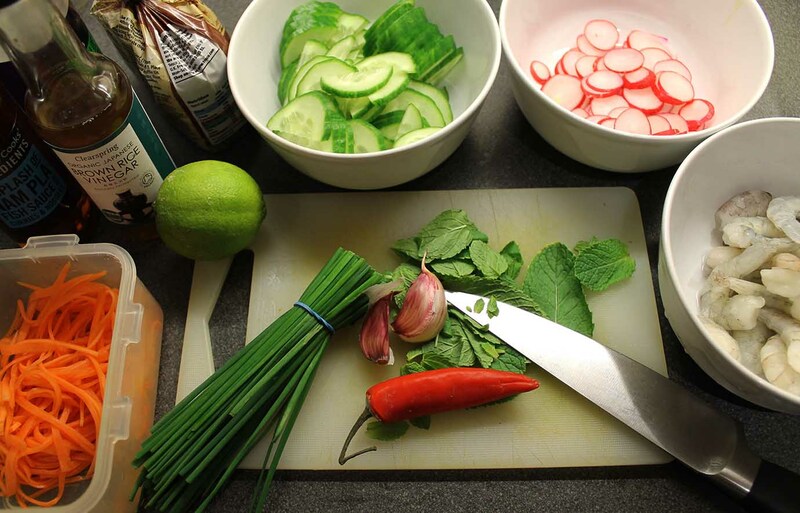 Marinate your prawns: in a bowl, mix the prawns, the lime juice, the sliced chilli and chopped garlic. Add the fish sauce, mix thoroughly and leave to marinate for about 30 minutes. Once that’s over, pour the whole lot in a pan and cook until dry (the marinade should entirely evaporate). Dress your plate as nicely as you can starting with the salad leaves and piling up all the other goodies on top (cucumber, radishes, pickled carrots, prawns). Add a bit of fish sauce (about one tablespoon will do) and a dash of sesame oil, as well as salt and pepper (and maybe a sprinkle of chilli pepper if you want). Top up with fresh herbs and admire your work… or you know, just tuck in! What’s your favourite salad? Looking for inspiration, hit me with your recipes! I’m one of those people who always, ALWAYS carry food everywhere they go. No matter where I’m going, it’s extremely likely you’ll find some sort of snack in my bag. And by “some sort of snack”, I mean enough food to feed a small army. For several days. Of course, I am also obsessed with lunchboxes but I tend to almost carry the same things (mainly leftovers). There’s absolutely nothing wrong with leftovers BUT if I want to make sure I don’t get food-envy come lunchtime (and end up going down to Pret for some chocolate croissants), I clearly needed some change! So I’ve been working on some healthy-bunny recipes over the looooong weekend and here 5 of my favourite new lunch ideas! Inspired by a few of Chocolate & Zucchini‘s recipes (see links underneath). (Serves 1) Prep your charred broccoli/avocado/tahini salad as explained here (I added chilli flakes and pomegranate seeds too). Make a one-egg omelette as explained here. Over-fill your omelette (isn’t that the only way to make a burrito anyway?). Serve with more charred broccoli. Now that I think of it, I’m sure the salad would be lovely with hard-boiled eggs mixed in too (and probably more convenient to put in a lunch box…). Inspired by Chocolate & Zucchini‘s excellent eponymous book. (Serves 1) Cook green beans in salted boiling water. Meanwhile, make a grain mustard + olive oil + cider vinegar + black pepper dressing. Toss in the beans. Sprinkle with Jamon (I brought mine back from Barcelona! ), walnuts and grated parmesan. Zucchini noodles alla puttanesca (V) Inspired by The Londoner‘s brilliant “Slutty Pasta“ but adapted to be vegetarian! (Serves 1) Using a vegetable peeler (or a spiralizer if you have one of those! ), make linguine-like ribbons with 1 big-ish zucchini. In a pan, cook 2 cloves of garlic into a spoonful of olive oil until slightly caramelized. Add in 6-8 sliced black olives, a spoonful of chopped capers and a pinch of chilli flakes. Toss in 1/4 of a can of tomatoes, 2 table spoons of soy sauce and let the whole lot reduce for a few minutes. Pour the sauce on your coodles and top with cracked black pepper, a little bit of olive oil and some grated parmesan. (Serves 1) In a food processor, blend 4 garlic cloves, half a bunch of parsley , salt, pepper and olive oil until you get a fairly homogenous green sauce. Put a pot of water to boil. When it is, add in your eggs and cook for 5 minutes, then cool the eggs under cold water and shell them off. Pan-fry about a bowl of shredded curly kale in a spoonful of olive oil (add a bit of water if it browns too quickly). Sprinkle with salt, dried garlic, black pepper and chilli flakes. Top with the sauce. Vietnamese Prawn Soup (Serves 2) In a big saucepan, fry some ginger, a few garlic cloves and the white part of a couple of spring onions. Add in two carrots cut into little straws, half a can of sweet corn and a few handfuls of bean sprouts. Add in some stock (I used some I made, but that would work as well!). Season with salt, chilli flakes, fish sauce and soy sauce, thenadd in your prawns (I used frozen un-cooked ones). Let the whole lot simmer for a few minutes, then pour the soup in a bowl and top with the green part of the spring onions, a small handful of chopped mint leaves and chives. What did you have for lunch today? Anything I could be inspired by? I’m always looking for new ideas!! I never thought I would say that, but I think I actually enjoy working out. Anybody who knows me even a little bit is most probably laughing already! But I swear it’s true. Plus endorphins are the best thing ever! I’m currently trying to work a lot on my legs as they are currently the part of my body I like least and I’d love to be able to wear shorts this summer without feeling bad about them. I’ve been sticking to more-or-less the same routine for about 3 weeks and I can already see results: my legs look thinner, stronger (and for some weird reason, I seem to walk taller, which is a good thing when you’re teeny-tiny like me!). But God! is it exausting! As I write this, I just finished this exercise and my legs are TIRED! But if you want to give it a go, here is my current leg workout routine! I start with 15 sumo squats I go down, stay there for 3 sec. and then go back up again. Then I do 2 reps of this (it’s all part of a workout which was published on Cosmopolitan that I found on Pinterest) After that, I do 15 more sumo squats and then go on with 30 calf raises (I stay up for 3 sec. before going back down). Afterwards comes a real killer: a 1 min. Tip Toe Squats. I first read about it there and thought ‘eh, that sounds easy and fun!’. Boy was I wrong about it!! I cool down with 2 more reps of the Cosmo workout, following up with a second 1 min. Tip Toe Squats. I then switch off my brain and follow all the steps of this video (I LOVE workout videos, I find it to be a very relaxing way to exercise as I don’t have to count or time myself or anything!!). Moving onto 15 more squats (either the normal ones, or 15 more sumo ones, depending on my mood and how much my knees hurt…). Working a bit on my balance with 10 single-leg Romanian Deadlift (on each side). Then flat out for 15 reps of Thrusts and Holds (while squeezing a medicinal ball between my knees. I know it doesn’t seem like a big difference, but trust me, it DOES!). Polishing off with 10 Lateral lunges (on each side), one more rep of the workout video and a 1 min wall sit with medicinal ball (squeeeeeze it between my knees to make my thighs work harder!). Pffff! So tired! I cool down with a few strech-ey moves and a BIIIIIIG glass of water! And then I start it all over again the next day! What does your workout routine look like? Anything I could include into mine? Send me your blog posts if you’ve written about it! Healthy Living | 3 ways to build habits that stick! 1. Figure out a way around it, that’d allow me to get to the same result. I could for example, give up on that level of Candy Crush I’m stuck on until I have enough magic candies to win it easy-peasy. Or get somebody to open all cans for me (I’m so bad at handling can openers that my dad formally prevented me to do so a few years ago). And yet it is when I go over that sort of things that I get the most rewarding results. Up to two years ago, I would have SWORN aubergines were not for me. It is now one of my favourite vegetables. Crunches were also not for me. They’re still not my best friends, but I’m working on it. And it was the same for a number of other things: un-doing my make-up every day, drinking enough water, stews… All sorts of things. Call me crazy but I don’t think there’s anything quite as satisfying as ticking things off a to-do list. I already confessed my addiction to tracking apps in my “How to drink more water” post, so you won’t really be surprised to hear that whenever it comes to building new habits, I turn to them as well. I still use Water Your Body to keep track of how much water I drink and I’ve started using Coach for all my other goals. Even if it’s not the most easy app to use at first, I like the flexibility it gives me in terms of goal-setting (you can pick goals from a list or create your own + you can decide how many times a week you want to perform a certain action). And you get to tick that box once you’ve accomplished any of your goals that day (which clearly doubles my happiness since 1. I kept up with my habit 2. box-ticking is so satisfying!)!! The other day, I was mid-way through my third set of 30 squats when I finally realised why it had been so difficult for me to keep exercising every day; it’s not that it was especially difficult, or that it hurt me; I was just bored of going through the exact same routine every evening. When it comes to staying motivated, I truly believe variety is key… You wouldn’t want to eat brownies for breakfast, lunch & dinner every day (or would you?) so why have the same packed lunch or exercise routine every day? Speaking of which, I’m currently working on some healthy packed lunch + snacks recipes… so hopefully there’ll be some ideas for you to get inspired by over here soon! How do you achieve your healthy-living goals? Any tricks to build habits that stick?